Just when we thought that the cries to bring back the Kohinoor diamond were fanned by the aftermath of the Royal visit, it seems, looming Punjab elections could be the trigger. How, you ask, will the return of a diamond help the people of Punjab? Just as the return of Tipu Sultan’s sword bolstered Kannada pride (even though the proud owner of unpaid loans fled to the UK), the return of Kohinoor is believed to restore the rightful legacy of Punjab. According to the extra-long and dotted legend of the Kohinoor, the 158.6 gram (793 carat) gem was originally mined from Kollur mines in Guntur, Andhra Pradesh was initially owned by the Mughals, Shah Jahan is said to have used it as a prism to view the Taj Mahal. After the fall of the Mughal Empire, the diamond went back to Persia, only to be procured by Maharaja Ranjit Singh. In the aftermath of Ranjit Singh’s death, the Sikhs fought two wars with the East India Company army. Duleep Singh, the minor son of Ranjit Singh and the then Maharaja in Lahore, was defeated in the second Anglo-Sikh war. 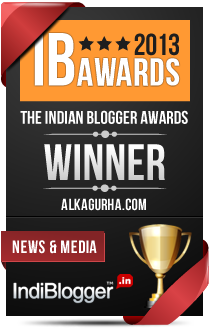 Punjab was thus annexed by the British, and the Kohinoor presented to Queen Victoria. Blimey, but the Kohinoor now rests ensconced in a crown in the Tower of London. As it happened, Indians filed a petition in the stiff upper court demanding their sparkle back. Friendly neighborhood, Pakistan joined the party, ‘Why should India have all the fun?’ ‘Humein Bhi Chahiye Kohinoor’. No pressure, no diamonds. In response to the political pressure, the Indian government cited a law that does not allow it to bring back antiquities taken out of the country before Independence. They reiterated the stand of the previous governments that Kohinoor was a gift. And presents, they say, are for the pleasure of who gives them and not the merits of who receives them. Right? Wrong. The Shiromani Akali Dal (SAD) said, “It is not possible for a young Duleep Singh to have gifted the Kohinoor unless he was tricked.” 'Humein Chahiye Kohinoor', they said. After the morality foreplay by the media, the culture ministry said that they will try to bring back the pleasure, err, treasure, amicably. Meanwhile the Congress jumped in the revelry by saying, ‘Humein Chahiye Azadi. Err, Kohinoor.’ They forgot that playing politics with history is a dangerous game. Wonder why the gem of their crown didn't remind his friend David Miliband about Kohinoor when both had spent a long night with cows. What is it that they say about covering your stump before you hump, eh? But polemics aside, in what is considered as a bad omen for men, the politicians should think twice before demanding the Kohinoor. 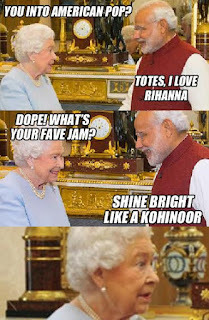 Given that the curse of Kohinoor dates back to ancient texts, and also given that the history of rulers who owned the diamond is mired with torture and treachery, the Brits played safe. Our prissy colonizers ensured that the diamond goes to the wife of the male royal heir. And no woman ever hated a man enough to give back his diamonds. So much for pleasure, err, treasure. The idea of expecting a return gift is fatuous. And what we fancy isn’t always a reality. Regardless of how we try to dress up history - with emotions or summons, the Brits are unlikely to provide us with the pleasure of owning the treasure. And that’s the extra-long and short of Kohinoor. The diamond, of course. What else did you think? Kohinoor Basmati rice? Well, wokay! Good to know I have sanskari readers. We have so many Koh-I-noors in the UK. Why stop at the giant solitaire. Give us Mallya and Lalit Modi as well. :) Thank you for stopping by Rahul. 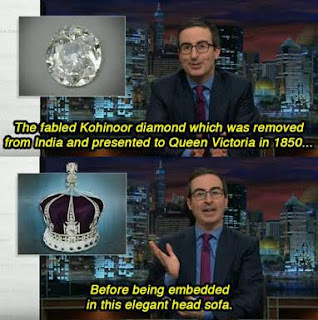 It's a used Kohinoor, isn't it? So why bother with the...errm...Basmati Rice, I say? Thank you for reading. The entire article is for the magazine Diplomacy&Beyond. I second, Purba. Let's get the real gems back. When will we still this dramebaazi? The song will play each time a celebrity visits us or ours visit UK. While the opinions of your honoured guest about Kohinoors in situ overseas in general and UK in particular, may differ, I am glad you recognize how fraught with risks this idea of restoration is. History says, about 1 in 200 among us is a descendant of Genghis Khan, which translates to about 62,50,000 Indians, and who knows who among us have the blood of that fearsome warrior coursing through our veins! The point is, if Mongolia lays a claim to whatever we apparently owe to them, many of us would have to be deported right away. Our Viju is no less than Kohinoor nestled in London. Guess, this priceless Kohinoor, the Brits wouldn't be interested in having or he could have been traded for the original one. Love your take on it. Made me laugh my lungs out.